Home » Recipes & Videos » CLOSED: March Painting Swap! THE MARCH PAINTING SWAP IS NOW CLOSED! To join, click here to make the $5 payment. After payment, you will be redirected to fill out a form with your swap details and painting preferences. The last painting swap was another massive success! We’ve been blown away by the awesome-ness there in the swap album. There have been requests for us to organize another and we’re so excited to help organize one again! Details and dates below. WHAT/SIZE: Every participant will make, send and receive a small painting as part of the swap. We suggest commonly available canvas sizes such as 8 x 10 inch or 10 x 10 inches, on a stretched canvas. The style is makers choice and can be anything that displays your creative point of view, but should it be an acrylic pouring style painting. It is encouraged that you take your swap partner’s preferences into account if they have given colors that they like or don’t like. WHERE: Everywhere! This swap is open to everyone. Each participant will be paired with a partner in their general area to keep shipping costs low. For those not in the US, we will do our best to match you with a painter in your own country. If you are willing to ship internationally you can say so when you sign up. WHO: All acrylic pour painters are welcome! Please remember when joining any swap, your partner may have a different skill level. We offer helpful hints, technique-based tutorials, and videos to help you succeed. Because of our community atmosphere, you are able to get help and ask questions along the way via the Facebook group. The March Swap is open for sign ups until February 28th, 2019. Once signed up you will be directed to a quick questionnaire to help us pair you with the perfect painting buddy. Then it’s time for us to get to work partnering you with the perfect swap partner. After the swap, each participant is invited to share what they have received/exchanged on our community page for all to enjoy. While waiting for your swap partners information, you can start to gather your materials and consider the style of painting you will make for your partner. Swap partner information will be emailed by March 1st, 2019. It is encouraged that you reach out to your partner after receiving their information to find out more “fun facts” about them. All paintings are to be mailed by March 31st 2019. Remember to take pride in your work by doing your best work, and finishing and presenting your painting nicely. Also, please think about how the person receiving this special package will feel when opening. Including a small treat or a notecard, is totally encouraged and will be much appreciated by your partner! Why should you be part of the painting swap? Who doesn’t love a handmade gift?! 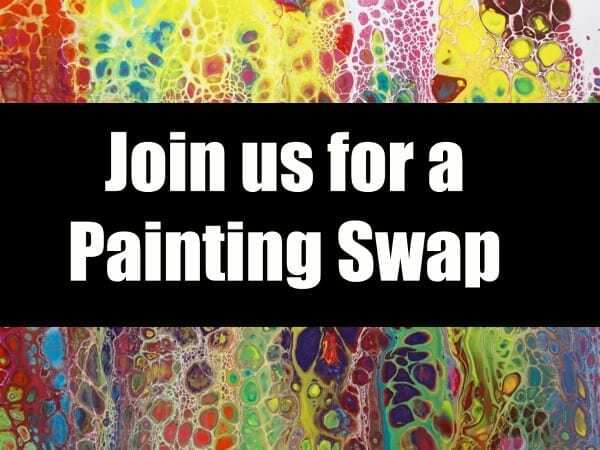 By joining the Swap, you will not only be exchanging paintings but you will be partnered with a painting buddy that shares your passion, understands your need for more paint and the joys of creating with color. Basically, someone who “get’s it”! We welcome you to join our Facebook group where you can upload pictures, ask questions and meet other members, you can also share your work over on Instagram- we’ll be using the hashtag #acrylicpouring. You can follow me on Instagram here. Come join the fun with our Acrylic Pouring Painting Swap! CLICK HERE to enter the swap. After making the $5 payment, you’ll be redirected to a form where you will enter in your swap details and painting preferences. Still have a few questions? Check out our Swap FAQ’s page here.